Arrange a confidential meeting to make a charitable gift as part of your estate plan. Call the Federation office 845-562-7860 for more information. We are pleased to provide you with a few background stories about our Named Endowments, which can be found here. 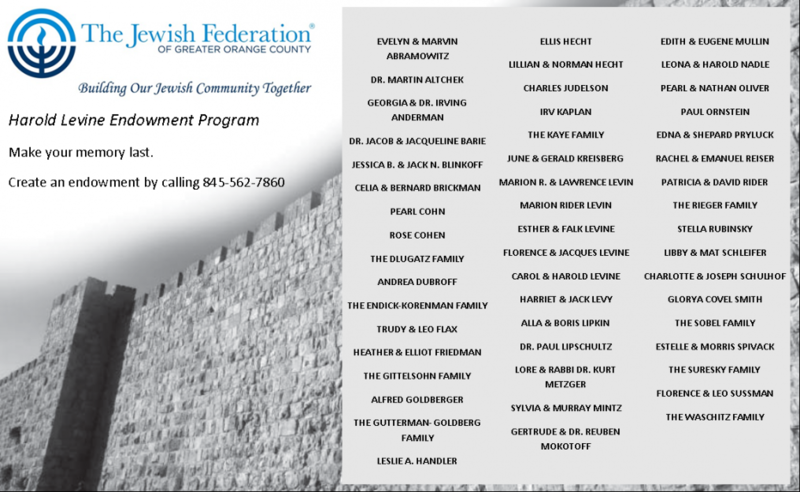 The Harold Levine Endowment Program of the Jewish Federation of Greater Orange County currently has 40+ Endowments with a principle of over $3,000,000.00. These funds can be established with any amount of money. The interest is reinvested in these funds until they reach a corpus of $1,800, at which time distributions can be made to named charities. All endowment funds must designate a minimum of 30% of the interest earned to the Jewish Federation Annual Campaign.